A few weeks ago, I had the very unoriginal idea of going to Mt. Vernon Estate on Presidents Day. Although we arrived shortly after opening time at 10 a.m., traffic drew to a slow crawl as we came within a quarter mile; not surprising, given that it was a free admission day. The parking lots were already overflowing so we headed back up the parkway toward home. 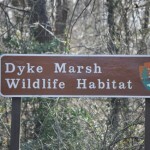 As we approached Belle Haven Park and Marina, I asked my husband, who was driving, to pull in so we could check out Dyke Marsh Wildlife Habitat. 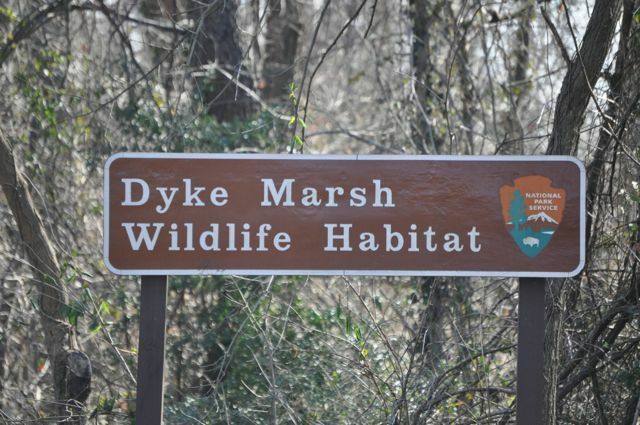 We have lived in Alexandria for more than 15 years and although we have had more picnics and parties over the years at Belle Haven Park than I can recount, we have never visited Dyke Marsh. 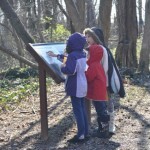 Despite the sign, I only learned about this great green treasure during my naturalist training last fall. With our morning plans dashed, it seemed a great time to explore. Fortunately, since we were planning to spend a few crisp and chilly hours at Mt. Vernon, we were equally prepared for a hike along the sandy Dyke Marsh trail, also known as Haul Road. Nestled between Old Town and Mt. Vernon along the George Washington Memorial Parkway, adjacent to Belle Haven Park and Marina, and a short skip off the Mt. 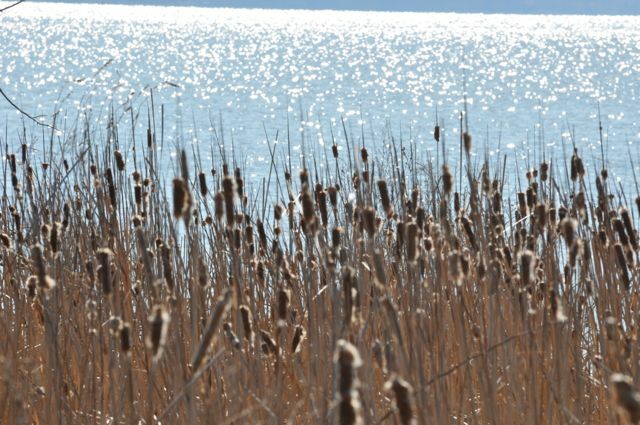 Vernon Trail, Dyke Marsh consists of 485 acres of tidal marsh, floodplain, and swamp forest. 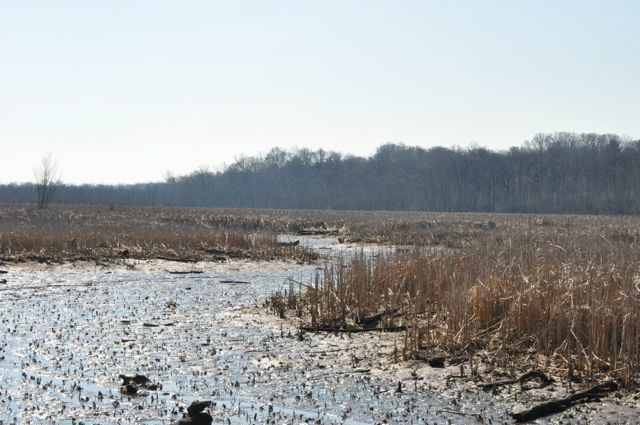 According to the National Park Service (NPS), which manages the marsh, it is one of the largest remaining freshwater tidal wetlands in the Washington metropolitan area. 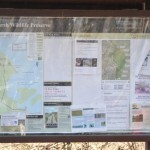 As we entered the trail, we read up a little on the history of the marsh on signage and in brochures available at the entrance. In the 1800s, an attempt was made by the land owner to turn the marsh lands into farm lands by building dikes around the perimeter of the marsh. It was part of an effort to control the tides and use the land for farming and grazing livestock. The effort was eventually abandoned when the dikes proved too difficult to maintain and the land eventually returned to its original state. 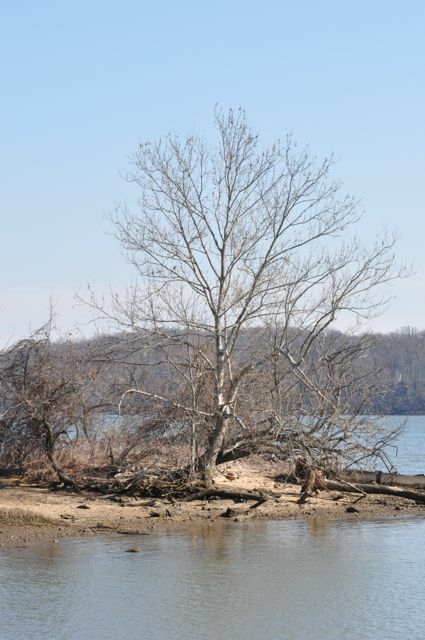 Between the 1950s and 1970s, the marsh was eroded when developers dug out gravel and replaced it with debris. 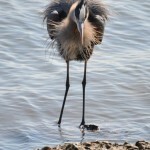 Since the mid-1970s, efforts have been underway to restore the wetlands. 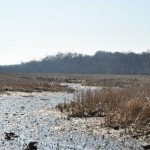 Erosion still impacts the marsh today. 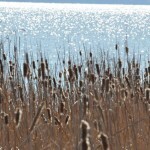 The marsh is home to more than 360 species of plants, including the dominant narrow-leafed cattail. Other species include arrowhead, arrow arum, pickerelweed, sweetflag, spatter-pond lilly, northern wild rice and more. 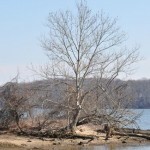 Unfortunately some invasive species, which grow aggressively and compete with native species for resources, have also taken root, including English ivy, porcelain-berry, Japanese honeysuckle, Asiatic bittersweet, yellow iris and the common reed. Aside from the invasive English ivy spiraling up trees, nests crafted in the nooks of branches, and immature leaf buds for preparing for spring bloom, the trees were mostly unadorned. The landscape brandished a subdued and brownish hue – a nice contrast to the still shimmering waters just a few feet away. The songbirds chanted and seemed to exchange greetings (or warnings) as we explored their habitat. The flat and curvaceous trail is friendly for hikers of a wide range of abilities and could easily be navigated with a stroller, though it might be a little tricky after rain. There were a few sizable puddles and muddy areas, but the path was still passable. 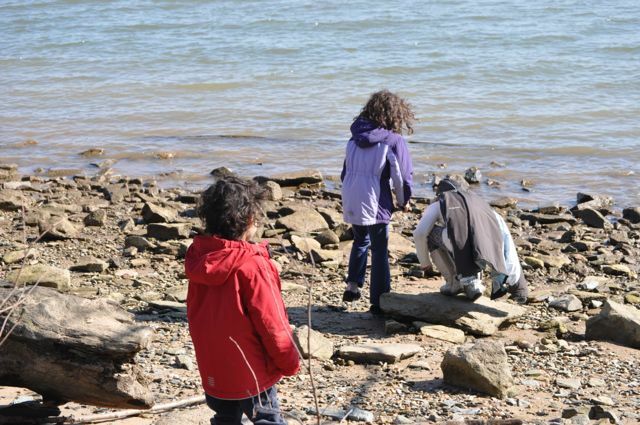 As we meandered along, we discovered a small, rocky beach area where, in warmer weather, children might dance on the shores, skip rocks or look for shells. Halfway along the trail, the land curves to the left and stretches into a peninsula with tall grasses and cattails on one side, and beaver damns on the other. 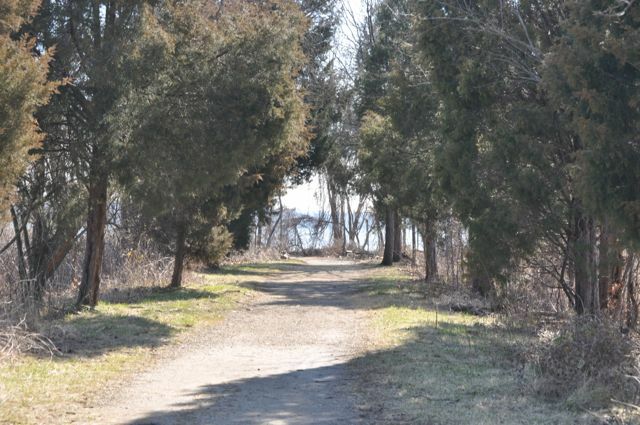 Eventually the trail evolves into a boardwalk that extends over the edge of the river, enabling visitors to enjoy a more encompassing land and water experience. A large platform hosts benches where one can sit, relax and escape into nature. The boardwalk takes a sharp left and extends for an additional stretch over the water, bringing visitors within what feels like striking distance of a small island with birds strolling along its shores. According to the NPS, the habitat supports a diverse array of animals, including: beavers, muskrat, little brown bats, red foxes, cottontail rabbits, gray squirrels, shrews and field mice. Amphibians and reptiles that reside at Dyke Marsh include bull frogs, leopard frogs, northern water snakes and snapping, box and painted turtles. 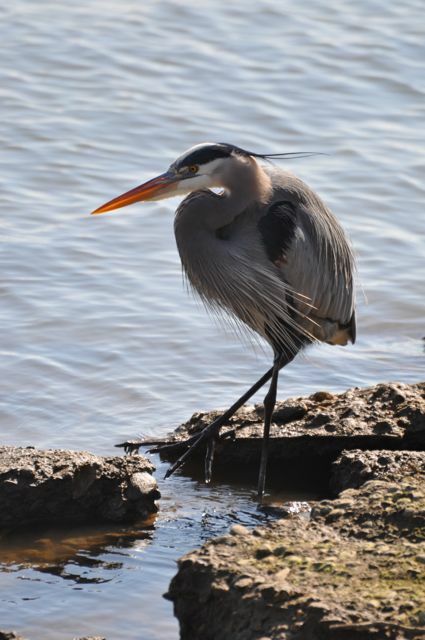 Known as a top birding spot in the D.C. area, nearly 300 species of birds have been observed in Dyke Marsh. 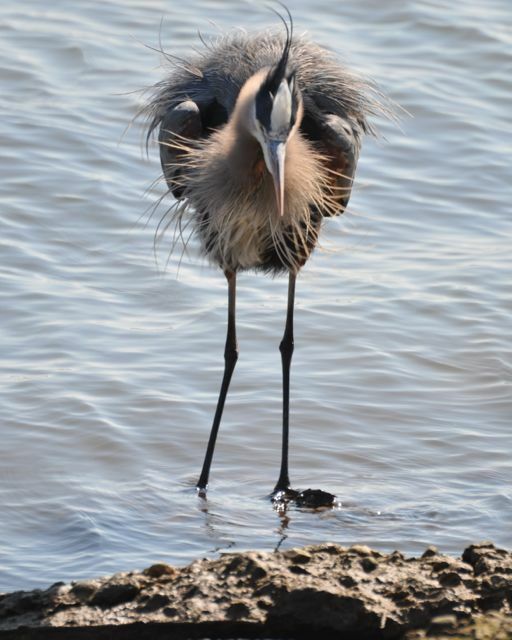 The Friends of Dyke Marsh, which hosts a weekly bird walk on Sunday mornings at 8 a.m., maintains a regularly updated, detailed list of bird sightings. 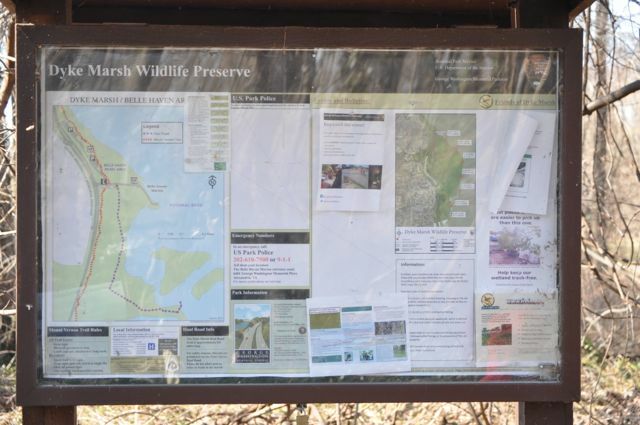 Although we did not encounter much wildlife on our hike, aside from the birds, we did encountered photographers, birders, dog walkers, families and individuals enjoying the trail. 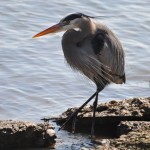 We were also thrilled to have met up with a heron who seemed to strut and pose for us as we stood, captivated and engaged. By the end of our hike, we were a bit cold and hungry, but also glad that our original plans for the day did not work out. As a result, wediscovered a new great green escape and immediately began making plans to return. Walking at a leisurely pace and stopping often to take pictures and observe, we were on the trail for more than an hour. 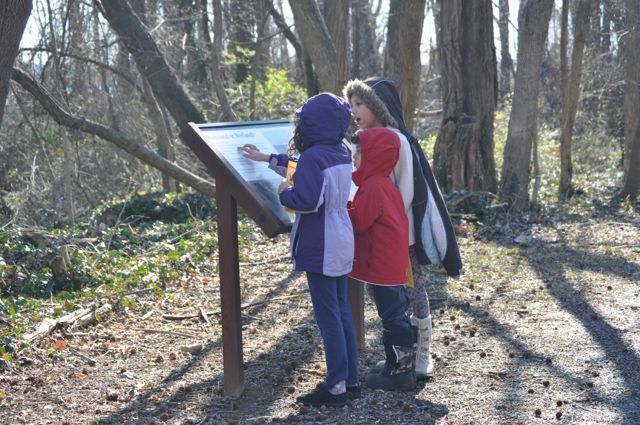 In warmer months, once plants, animals, insects, and others have rebounded from winter dormancy, one might easily spend a couple of hours exploring. Mornings are always a great time to visit natural parks, especially during summer months, before the peak heat of the day. Evenings are also a great time to sneak a peak at creatures who thrive at sunset, like fire flies and nocturnal mammals. Free parking available at Bell Haven Park (though it can fill up quickly during peak times and on weekends). 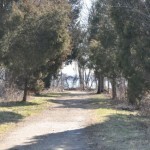 Once you are there, head towards the marina, but veer off on the path to the right that leads to Dyke Marsh. There are no public water fountains at the marsh, but there are fountains at Bell Haven Park. Bring your morning coffee, pack your lunch, or bring the family for a dinner picnic at Belle Haven Park before or after your hike. You can also pick up food at the Belle Haven Shopping Center, which has a number of eateries and stores, including a full grocery store. Restrooms are available walking distance away at Belle Haven Park. Bikes are not permitted at the trail, but can be left at a bike rack near the entrance or at the park. Strollers are permitted and navigable with a few bumps along the way. From Old Town, head south on the George Washington Memorial Parkway and take a left at the Belle Haven Park and Marina exit. Bear left immediately and park in one of the two parking lots visible from the street. Then walk south along Mt. Vernon trail towards the Marine and veer off to the right to the trail map. 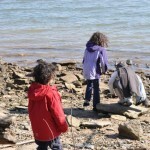 Know of a other great places to watch birds and commune with nature? Tell us about it in the comments.